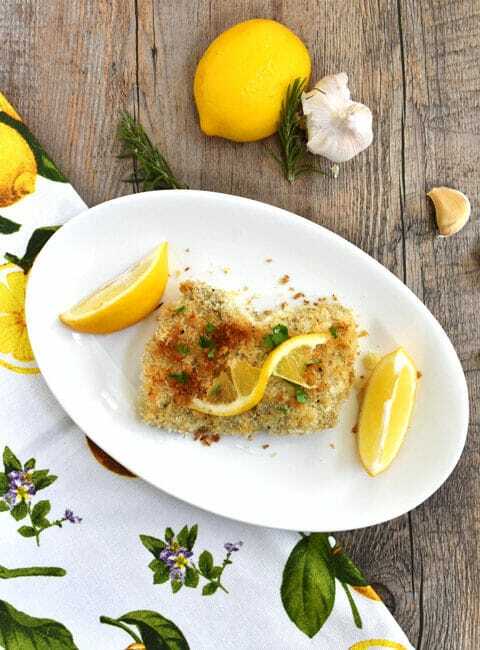 Breaded Lemon Garlic Chicken uses olive oil instead of eggs to help the breading adhere to the chicken. I learned this technique from my dear friend Brenda and in our house, we simply call this delicious dish: Brenda’s Breaded Chicken. First posted in 2011, I’ve modified the recipe just a smidge and updated the photos. This recipe never gets old – we love it just as much now as we did then. Multi-tasking. We usually thinking of it in the context of work or school, but I really appreciate it in the kitchen. I love multi-purpose ingredients, finding creative ways to use small amounts of soon-to-expire foods, and leftovers I can use to create other dishes. This super-simple lemon garlic chicken recipe from my dear friend, Brenda, qualifies for all of the above. 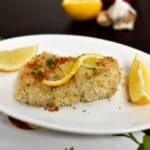 One simple twist makes this lemon garlic chicken stand out from your usual breaded chicken recipe: you dip the chicken in garlic-flavored olive oil instead of some sort of egg or milk mixture before coating with the breading. And if you have leftovers (unlikely! ), there are many creative ways to use them. When I make the bread crumb mixture with Italian seasonings, I might use the leftover chicken for chicken parmigiana sandwiches the next evening. You could cut the leftovers into strips and prepare a caesar chicken salad the next day or you can just reheat the chicken and eat it as is. The breading is also a smart way to use up leftover bread/bread crumbs/crackers/even cereal in your house. Use whatever strikes your fancy. Sometimes I use homemade crumbs from leftover bread, sometimes Japanese panko, sometimes store-bought bread crumbs, sometimes leftover crackers or even cereal that isn’t too sweet – corn flakes or raisin bran for example. And be creative with how you season the crumbs – recently I tried fresh rosemary from my garden and that married so nicely with the lemon! 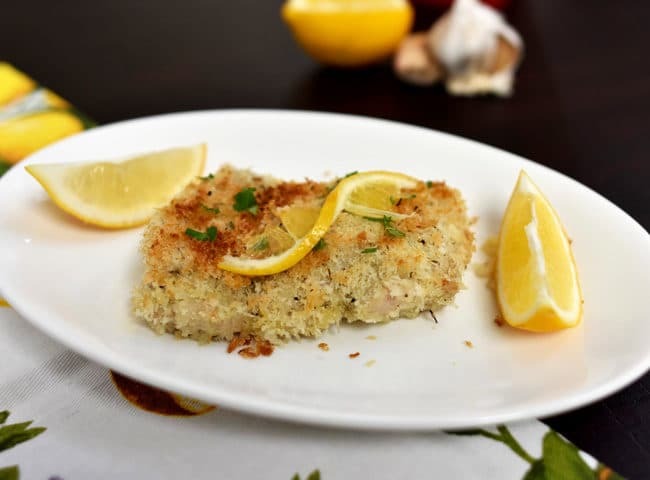 This recipe works fine with the amounts I give you but consider it a starting point — you decide how much chicken to use and what type (boneless skinless thighs or breasts or pre-cut breast tenders), you decide what breading to use and what olive oil you have and then create. In this update, I’ve added lemon zest to the bread crumb mixture and a squeeze of lemon at the end. Because in our house, everything tastes better with lemon. I have made this lemon garlic chicken recipe at least 20 times with everything from breasts to thighs to pre-cut tenders and it has always been moist and flavorful. My family smiles when they see me making this and yes they frequently exclaim OMG! Yummy when they eat it. Really they do. Place garlic cloves and olive oil in a small saute pan on med low and let the oil and garlic heat up - but don’t let it boil. 5 or 10 minutes will do it. Then let it sit for a bit to cool down. 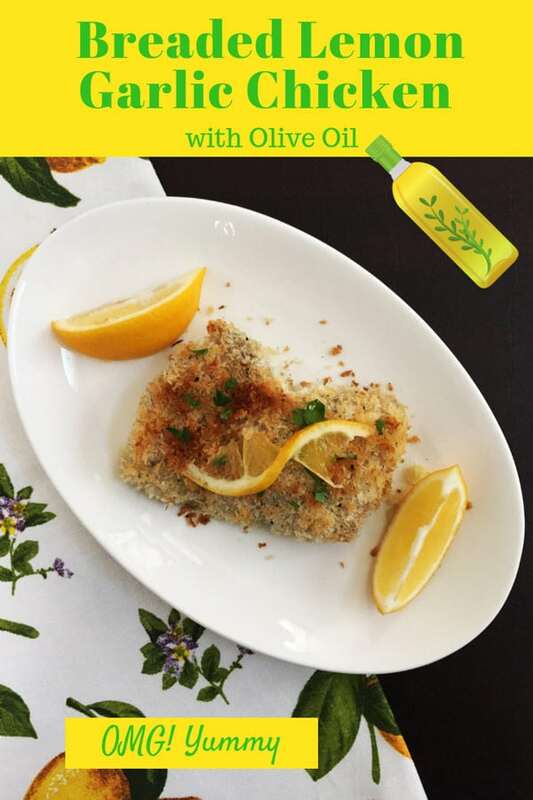 Once olive oil is cooled down, dip each chicken piece in the olive oil mixture and then bread crumb mixture and place on a non-stick or parchment-lined baking sheet. If you have extra bread crumbs or olive oil, sprinkle the extra over the top of the chicken. Right before serving, squeeze some lemon juice on the chicken from the lemon you zested. This is a great way to infuse olive oil with garlic for immediate use in a recipe and we’ll be definitely trying this! We often have ready-made garlic-rosemary infused EVOO in our pantry which we add as dressing in salads etc. We let the garlic and the fresh rosemary stay in the olive oil for 1 day and then we strain it and keep it in the pantry. The reasoning behind this, is that we use cold-pressed EVOO which keeps all of the vitamins so we prefer not to heat it up, if using it raw, in salads etc. Ever tried it this way yourself Beth? Now, the chicken in this recipe must be SO AMAZING! We bet the crust must be super-yummy and we loved that you baked and didn’t fry these. So, you also didn’t use the classic flour-eggs-crumbs technique. SO interesting!!! I like your idea to include rosemary. We have a bit stash in the garden that is being under-used right now. So many great variations in here – I’m very intrigued about dipping in olive oil rather than egg. I also discovered that you freeze fresh rosemary or dry it or make lemon rosemary salt with it. Hopefully that will help you use up some that stash! 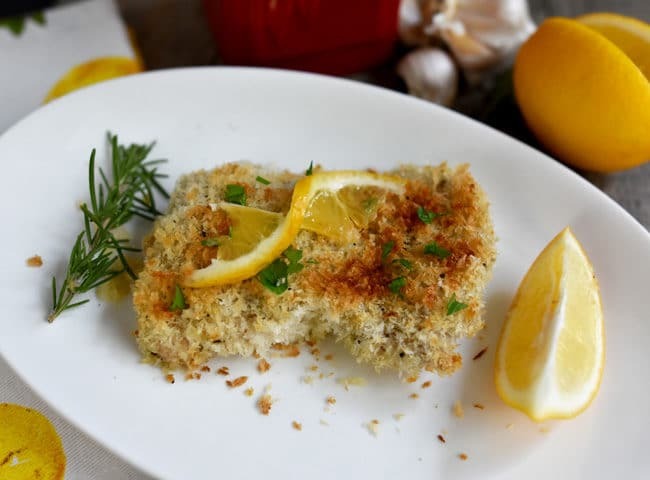 Love the lemon and garlic together here and the light breading! Thanks! Such a comfort food combo right?! Thanks for stopping by. Oh perfect! I flagged the email and just read it. I have breasts at home and I wasn’t sure what I was going to do with them. With Alan home from the hospital, I’ve been cooking a lot lately and that’s new for me. I think we are both going to LOVE this. Thank you, dear friend. When you add it to the menu – I get a little extra excited. Shana Tova. 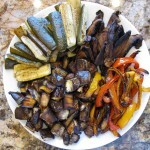 As a “new” subscriber to your blog, thank you for this recipe! I like garlic and love lemon. I’ll use the microwave to heat up the garlic and olive oil. 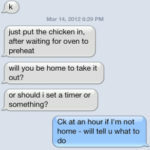 Can I cook the chicken on the stove top? I’ll be halving the recipe (cooking for two here). Good idea about the microwave. Re cooking on stove top – well I used to make a chicken early in our married years that I pounded thin and pan-fried and finished with lemon. I don’t see why it wouldn’t work – it will likely be even crispier and if it were me, I’d deglaze the pan after with lemon juice – yum! What a wonderful idea to use olive oil instead of egg. So much easier! Mustard works really well too! I love that these are baked too. Very nice recipe which I’ll be trying soon! This is a creative and delish recipe! Love that I can use any leftover breading to make the bread crumbs, the perfect way to have no waste. The garlic infused oil is amazing! Thx for the kind words and for stopping by Eileen! And yay for no waste! I always dip my chicken in egg first, never tried using olive oil instead. You know I’m all over this! Woah – I have an olive oil use that you haven’t tried yet??!! Feeling kind of spiffy right now. It’s the best — the chicken is always always good! Yay! Thanks for stopping by Sergio! Looks delicious, can’t wait to try this tonight! Dang, this looks and sounds so fantastic, Beth! I think the olive oil is magical! So much flavor is packed into this breaded chicken. It is a delicious dinner that my kids always demolish. And the infused olive oil smells so good! My kids LOVED this chicken – always put a smile on their face. Thx for stopping by. This looks so simple and delicious! Love it! You had me at the title of this post! This one looks so good and easy to make after a long, busy day. I also like that you can use them for good leftovers the next day (like for lunch!). 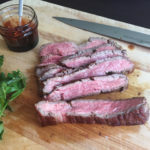 Thanks for sharing this recipe and for posting the pictures too. Congratulations on SITS day! This looks really yummy! I could totally make this! (I’m cooking challenged). It’s going on my meal planner for next week. Thanks for sharing and happy SITS day! Come by next week (or before) and tell me how it came out! And yes, you can totally make this. Thanks for stopping in today. Yum, yum, yum!! You’re blog is so appropriately named. I like to think so 🙂 I crack up now when I am out and here someone taste something and say OMG! Yummy. Hopefully someday they’ll be referring to my blog! Love the idea of simple and adored by family. Thanks for sharing. When my friend gave me this recipe, she just told me verbally as though it was no big deal but I just honed in the olive oil part and knew it would be wonderful, easy, and different. My kids are always asking for Brenda’s chicken! Thanks for stopping in! mmmm … I do love breaded chicken! And this looks simple enough to do! Really it is easy and healthy and economical so give it a try! Looks yummy, can’y wait to try! My kids would LOVE this. Thank you. Sounds delicious! My family loves garlic, so I am eager to try this. 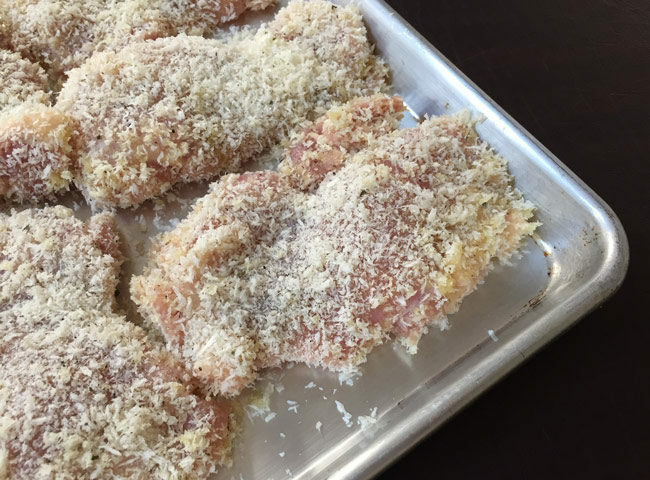 When I coat chicken in crumbs I like to add a bit of parmesan and Bisquick, which seems to help hold the coating together. Congrats on SITS Day! Yes – I do add parmesan but never thought about the Bisquick or flour in small amounts. Nice idea! Thanks for sharing. This does look and sound yummy. There are several picky eaters in my house and I think they would even eat this. 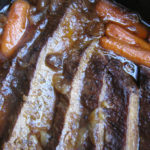 I also like that you were specific when you mentioned substitutes; someone who doesn’t know much about cooking would feel confident playing with this recipe based on your suggestions. 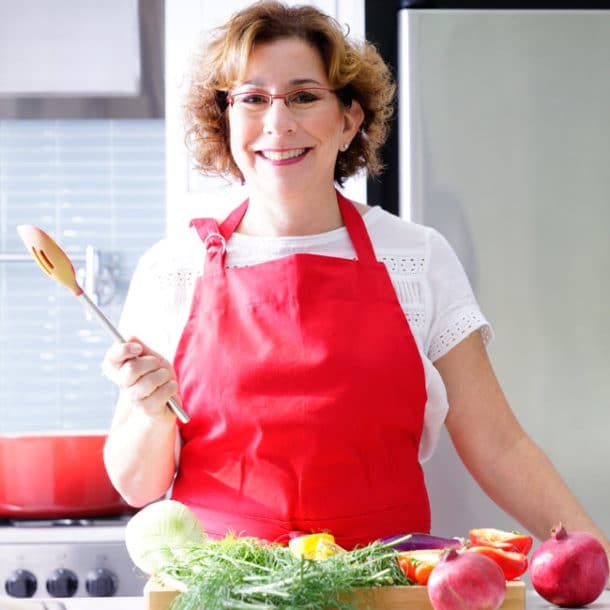 Thanks for that feedback – people tell me I should teach beginning cooking classes because I always include lots of details. Maybe it’s because I have kids or I just realize that I once knew very little and the more you learn, the more confidence you build. Go forth and conquer, I mean cook! These look so crunchy & delicious! Yum, can’t you just hear the sound as you bite into your first juicy, crispy bite? Go make this dish right now! That looks pretty simple, even I could manage it! Think the man will love me for it. He will and of course you can manage it. I just know it. Come back and let me know how it goes! I wonder if that would work for fish too…. Hmmm – good question – probably a firm fish like salmon or swordfish would work great. Probably a flakier fish would too – just have to be gentle while dipping and breading. Let me know if you try it! This looks SO good, and simple… both things that I’m very interested in! Haha. Congrats on your SITS day!!! Thx Sheri. Early week I have energy, Midweek I start to drag so something easy but satisfying is always welcome. Stay passionate about your cooking and pass it on to others! Gorgeous photos! I will have to try this out, sounds great! Happy SITS day! Thanks! Hope you try it and like it! It’s a staple in our house! I’m doing this next week, my husband started a litle diet and since is baked he’ll love it and the kids too. Mmmm…. I love a good baked chicken! The garlic infused olive oil must impart so much depth and flavor! I’ll definitely give these a try next time I do chicken for dinner! YUMMY! I am off to do my food shopping today and I will be getting the items to make this! If you have time, pop back and let me know how it turns out! This recipe looks so easy! We find cereal makes a great alternative to breadcrumbs (esp. for GF versions of breading) and it’s a good way to use what’s in your cupboard. I totally agree and it is such an easy way to change up the flavor each time you make it. Thanks for stopping by! Beth, this dish looks so good! I love the olive oil twist and I LOVE the squeeze of lemon. It makes me think of schnitzel. I adore schnitzel. Love that last snap as well! Enjoy your weekend! Thanks Julie! I have to admit my TechSavvyTeen jumped in on the last photo using my little camera and got that inspired angle and close-up. I want his eye – it’s amazing. And the lemon is my daughter’s influence – she is always the one to ask for a lemon wedge, even when it’s not obvious, and it’s always a good call. Hmmm – schnitzel – wonder how this would be with pork??? Thats a perfectly baked breaded chicken. OMG yummy is right!! So simple and sounds tasty! Came from SITS… I hadn’t thought of the olive oil dip instead of the egg/milk or mayo. I love substitutions in recipes! I’ll have to try this one. Pictures look great! This looks so easy and delicious. I wish I had chicken thawed so I could make this tonight. Definitely making it soon! Thanks for sharing. You’re welcome. Thaw some chicken today and give it a try! Have never breaded and baked before. Sounds not terribly sinful and yummy. Will definitely try this. Thank you! Works just as well with kids as adults. Give it a try and let me know what you think! Yes, you can do it, really you can! It really was (and is)! Give it a try. Hello from SITS. Your recipe looks yummy. Great photography too. Can’t wait to try it. Let me know if you try it and what you think. I love feedback! Glad you liked the photos – some were mine and some were my son’s – aka Tech Savvy Teen.